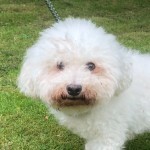 Pet of the month for June 2018 is a handsome Bichon Frise called Bertie. What possessed Bertie, at 19 years of age, to change the habits of a lifetime and consume some glass nobody will ever know, but luckily his owner was at hand and observed this. She quickly rushed him in to the surgery, where radiographs confirmed the presence of 3 pieces of glass in his stomach. Despite worries over his age Bertie underwent an exploratory laparotomy under general anaesthesia to locate and remove the glass. We are delighted to report that Bertie is doing really well and has bounced back to health! 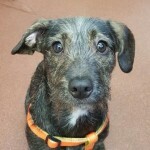 Pepper is Pet of the Month for May. She is a rescue dog with a chequered past who has recently found a good home. Her new owner is making good progress dealing with her separation anxiety. Separation anxiety and behavioural problems can occur in dogs when they are left home alone. Dogs are social creatures that have evolved to live with humans. It isn’t surprising therefore that unwanted behaviour sometimes occurs when a dog or puppy is left ‘home alone’. However, whilst it is often assumed that the problem behaviour is triggered by ‘separation anxiety’, this is not always the case. It is therefore very important that the reason for the unwanted behaviour is clearly identified for each individual. What sort of problem behaviour is typically seen? The most commonly reported separation problems in dogs are excessive barking or howling, eliminating indoors and damage to the house or its contents. Dogs may also show physical symptoms such as excessive salivation, or compulsive behaviours such as pacing or excessively licking themselves. Most start to show the problem behaviour as soon as the owner has left, but others may not do so for some time or may start to feel distressed as soon as they realise the owner is about to go out. They may then try to stop them leaving, perhaps by blocking their access to the door or – rarely – by becoming aggressive. What causes separation anxiety or other problem behaviour when a dog is left alone? Dogs may show unwanted behaviour when alone for a wide variety of reasons. For example elimination may be an involuntary reflex reaction due to separation anxiety. However, it may also occur because the dog isn’t properly house trained and so eliminates if he is caught short whilst the owner is out. It may be due to a urinary tract infection or another medical problem that makes the dog need to eliminate more often. In geriatric dogs it may be due to declining mental faculties resulting in confusion about when or where to eliminate. Destructive behaviour when left alone, such as when the dog scrabbles at a door or window, may be caused by the dog trying to follow the owner due to separation anxiety. Alternatively, the dog may chew out of boredom or may cause damage whilst trying to get to something he wants. It also isn’t uncommon for a dog to spend a happy afternoon raiding the cupboards and fridge when left alone in the kitchen, but to settle perfectly happily if left in a room where there is no access to food. This is more a case of ‘whilst the cat’s away….’ than emotional distress. Vocalisation may also have multiple causes. Dogs vocalise to communicate and may howl or bark for prolonged periods due to separation anxiety. However, they are also likely to bark if someone approaches the property and they are trying to guard it. It therefore can’t always be assumed any barking or howling is triggered by emotional distress at being alone. Even where the unwanted behaviour is triggered by emotional distress, this may arise for different reasons in different dogs. Some dogs appear to become overly attached to or dependant on their owner. These dogs seem genuinely distressed at being separated from them. In other cases the distress may be because the dog didn’t learn to feel comfortable being alone as a puppy. He may then become distressed the first time this happens, such as when a family member returns to work or a doggy (or feline) companion dies. Some may bark and scrabble at doors out of frustration because they want to accompany the owner on their adventure into the wide world outside. In a few cases the unwanted behaviour is triggered by something happening when the owner is out that makes the dog scared. This can then lead to the dog becoming fearful whenever they are alone in case it happens again. How do we know what is causing the separation anxiety or other problem behaviour? Finding the causes for separation anxiety (or other problem behaviour) requires a careful assessment of what is happening when the dog is both with people and alone. Video recordings of the dog’s behaviour when no-one is there can also be very revealing. For example if a dog causes damage to doorways as soon as and every time the owner leaves, this is likely to be due to some kind of emotional distress. Observation of the behaviour will show if it is due to anxiety or frustration, and the dog’s history will reveal if it’s due to lack of familiarisation as a puppy or over attachment. If the behaviour doesn’t occur until much later, is directed to household contents and occurs in a young or under exercised dog, it is more likely to be boredom. If the behaviour is intermittent, video recordings may reveal certain triggers for the behaviour, such as when bins are collected in a dog with a phobia of lorries. How can we prevent separation anxiety and other separation problems in dogs? Most puppies can be familiarised to being home alone if they are taught to gradually accept this when they are very young. Other problem behaviours can be prevented by teaching your dog to prefer being outside when he wants to eliminate and making sure he has plenty of exercise, stimulation and companionship. How can we stop this behaviour? If prevention hasn’t worked then the method of correction will depend on the cause. For example, if indoor elimination is due to a lack of house training this can be rectified by teaching the dog to prefer to be outside to eliminate using similar methods to those used with puppies. If the dog is being destructive due to boredom this may be helped with toys, improvements in overall exercise and stimulation or reducing the period of time the dog is left alone. 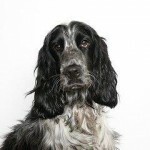 However more complex problems may require a tailored treatment package developed specifically for your dog’s needs by a specialist in this area. If your pet is showing problem behaviour when left alone then discuss this with your vet. They will be able to rule out any underlying medical problems and, if necessary, refer you to a suitably qualified behaviour expert. Pet of the Month this April is Hank, a handsome 7 year old Labrador. 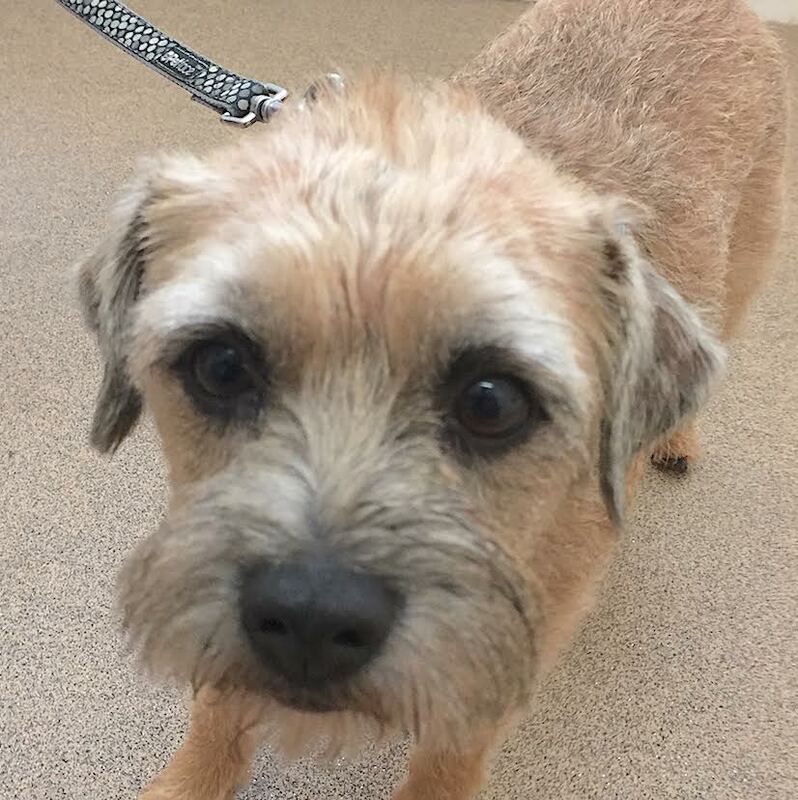 We are delighted to report that he has recovered extremely well following recent surgery for Gastric Dilatation. 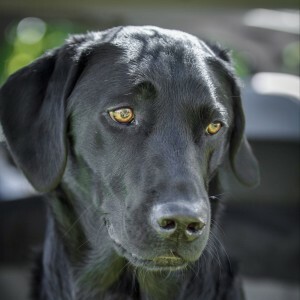 “Hank, my 7 year old black Labrador had been competing in a working test on Sunday and wasn’t his usual self. He seemed reluctant to jump and just wasn’t as obedient as he normally is. I have no idea if he was already feeling a little off colour that day, and guess I will never know. Within 45 minutes of eating his dinner that evening he started to try and vomit, but nothing was coming up. He was stretching, lying in the praying position and just generally not looking very happy. I was immediately suspicious that this could be a torsion and so I rang Lisa and Kate who agreed to see him. By the time I got to the surgery at 6.30 pm he was clearly becoming distressed, so we x-rayed his abdomen and it was showing that indeed he had a twisted stomach. By then was pale and shocked and his abdomen was getting larger by the minute. Hank was put on fluids and prepped for surgery. His surgery lasted over 3 hours, but was thankfully successful. What is gastric-dilatation and volvulus (GDV)? Is my dog at risk? Gastric dilatation and volvulus, or GDV as it is commonly abbreviated, is a relatively common clinical syndrome seen in large / giant breeds of dog. Dilatation refers to bloating of the stomach with gas, and volvulus refers to twisting of the stomach about its axis. The cause of this syndrome is not completely understood. In fact it is quite controversial which occurs first; the bloat or the volvulus (twisting). Indeed both components do not have to occur together and some patients will develop relatively simple bloat alone. GDV is a potentially life threatening condition and emergency veterinary attention should be sought immediately if it is suspected. Why is GDV potentially life-threatening to dogs? There are a number of serious and potentially fatal consequences that occur as a result of GDV. Initially the severe distension of the stomach stretches the blood vessels over its surface reducing the blood supply to the stomach walls. This is made worse by the twisting of the stomach which also twists the blood vessels, effectively shutting off blood supply to the stomach. A lack of blood flow means there is a lack of oxygen and nutrients delivered to the stomach and waste products are not removed. As with any organ this will result in parts of it dying. This process happens very quickly and in severe cases could result in part of the stomach wall rupturing and releasing its contents into the abdomen. The large distended stomach occupies much more space inside the abdominal cavity and compresses surrounding structures. Severe distension puts pressure on the diaphragm and interferes with the patient’s ability to breath. It also applies pressure to a large blood vessel in the abdomen (the vena cava) that normally returns blood from the back half of the body to the heart. Pressure on this vessel obstructs flow therefore reducing the amount of blood returned. If blood can’t be returned to the heart, then it in turn can’t pump it out to the rest of the body. If there is insufficient blood being pumped, the blood pressure falls dramatically making the patient weak and potentially leading to collapse. To add insult to injury, other organs in the body such as the lungs, kidneys, liver and intestines do not receive a blood supply and begin to fail. The lack of a functional circulation also means that toxic products build up in these organs that further compromise the patient. These changes can happen in a matter of hours, emphasizing the importance of early veterinary attention. What are the symptoms of GDV in dogs? The symptoms generally include obvious distension or enlargement of the abdomen with unproductive vomiting or retching. The patient may drool excessively and appear restless or agitated. As the condition progresses the patient may become increasingly weak or even develop shock and collapse. What is the treatment for GDV? The age and breed of the patient coupled with the clinical signs of a severely bloated abdomen will make your vet highly suspicious of this condition. They will immediately place one or more an intra-venous catheters to allow administration of fluids to support the circulation and dilute toxins in the blood. They may also analyse the patient’s blood to assess the severity of organ damage. The next stage involves attempts to decompress the stomach. This is usually accomplished by passage of a specially designed tube through the mouth down into the stomach. There is a gag that can be used to assist in this process but many patients will require sedation or anaesthesia to complete the task. It can be very challenging or sometimes impossible to perform stomach tubing. This is particularly the case when the stomach is twisted 360 degrees or more. In this instance a cannula (tube) may have to be inserted through the body wall and into the stomach to allow deflation. Deflation is clearly an imperative step because it will relieve pressure on the diaphragm and help restore blood flow back to the heart through the vena cava. Radiographs of the abdomen are often required to help distinguish between simple dilatation and dilatation with volvulus. In the latter case surgery will be required as soon as the patient is stabilised. The aim of the surgery is to de-rotate the stomach and assess it for areas of devitalisation. If there are areas of the stomach that have undergone necrosis (died), these need to be removed surgically. It is vital that the stomach is attached to the inside of the body wall. This is called a gastropexy and it will prevent volvulus in the future. This is essential as up to three quarters of the patients that do not have this performed will have another episode in the future. This also applies to those patients suffering with bloat alone as they have the same risk. What are the risk factors for GDV in dogs? What breeds are predisposed to this condition? Although these are the breeds we typically see GDV in, it is worthy to remember that it can happen in any patient. With improved understanding of the secondary consequences of GDV and excellent anaesthesia, surgical and post-operative care now available for veterinary patients a good prognosis can be achieved for this condition. Survival rates of 73-90% would be typical. There will always be a range quoted for survival because individual patient’s circumstances in terms of severity, age, general health and treatment received will have an impact on the outcome. One important factor that has been shown to decrease the survival is the presence of clinical signs for greater than six hours. This emphasizes the importance of prompt veterinary attention in all cases. If you are in any doubt that your dog is suffering from bloat or GDV, please call your vet immediately. Meet our wonderful slimmer, Poppy. She started Sienna’s weight clinic at a whopping 17kg and now weighs 12.7kg. Her overall weight loss is absolutely enormous! Poppy and her owners have done so well to achieve her target weight! Her quality of life has improved dramatically. She attends hydrotherapy once a week for her hip problems and now swims with jets on because she’s too good! Canine obesity is in fact the most common nutritional disorder seen in dogs. As with humans, it’s caused by an imbalance of taking in more energy than giving out. This can give rise to a persistent and potentially life threatening energy surplus. Signs of canine obesity include owners struggling to see or feel their dog’s ribs, spine or waistline; abdominal sagging; a bigger, rounder face; a reluctance to go for walks or lagging behind; excessive panting; and the dog appearing tired and lazy. Grossly overweight dogs may even need assistance getting up and down, in and out of vehicles, and often refuse to move or play games. Vets see these problems all too often, with obese pets posing greater risks from anaesthetic and surgical complications, heat or exercise intolerance, complications from cardio-respiratory disorders, hormone problems, skin disease, cancer, urogenital disorders, even early death. Canine obesity may even contribute to tracheal collapse and laryngeal paralysis too. Common canine problems suffered as a result of obesity include diabetes (where the pancreas fails to secrete enough insulin in order to regulate blood glucose levels); heart disease (caused by high cholesterol levels); as well as arthritis directly affecting mobility, making it even harder for your pet to lose weight. Until fairly recently, fatty tissue was thought to be just a relatively lifeless energy store and insulator; but we now know it secretes hormones affecting appetite, inflammation, insulin sensitivity and bodily function, as well as influencing water balance and blood pressure leading to kidney disease and high blood pressure. If your dog is overweight then carefully start changing his feeding habits; increasing exercise (e.g. more or longer walks, or take up a canine activity such as agility or flyball); looking at the type of food and his intake; creating a feeding plan. One of the very best ways is to make regular visits to your vet nurse for weight loss advice and to have free weight checks and record your success. Come and join our weight clinics today! There is a small £5 joining fee after which you and your pet receive a weight management booklet with tips on keeping your pet at a healthy weight, body condition score chart, measuring cup, calorie chart of common treats, food diary and leaflets on foods available to help your pet lose weight. This is followed by regular free of charge check-up appointments to ensure your pet reaches his/her optimal weight. Phone today to book an appointment with our weight management nurse Sienna! This month’s pet of the month is Ruby, who has been suffering from tracheal collapse for the last nine years. She has been fortunate in that her symptoms have been limited to a chronic cough and have not progressed to more serious respiratory difficulty or distress. How can I tell if my dog has tracheal collapse? Tracheal collapse is characterised by a harsh “goose honking “cough that is often worsened by excitement. The disease is often worse in the summer months due to the heat. 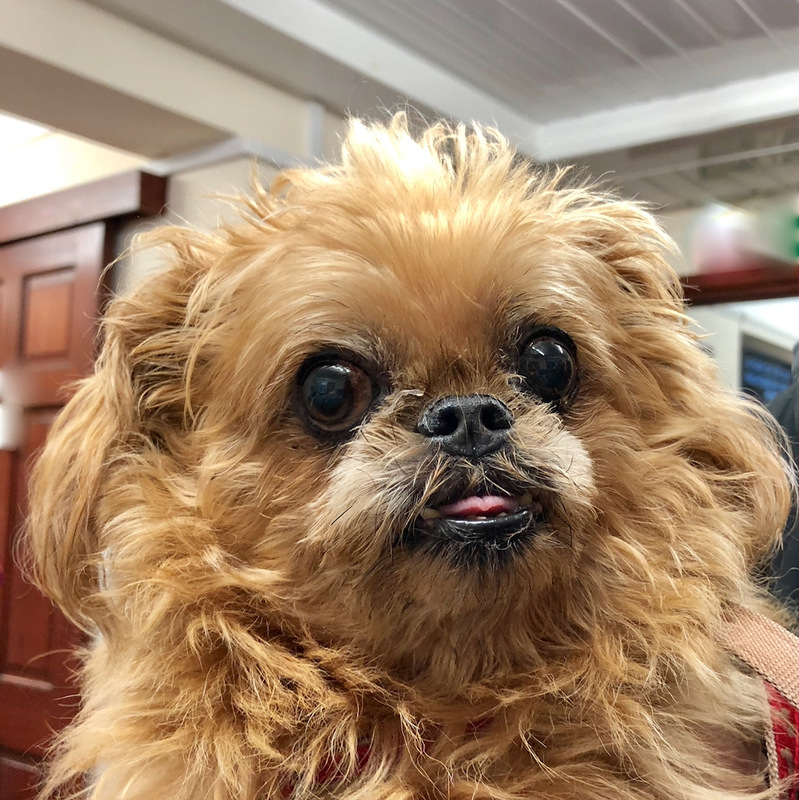 While the disease typically progresses over months or years, some dogs can present with a sudden onset difficulty breathing and require emergency therapy. Dogs with tracheal collapse can often have other conditions including heart murmurs, pneumonia or problems with their larynx/palate. How is tracheal collapse diagnosed? Tracheal collapse is a dynamic process meaning that it can often be missed on normal chest radiograph (x-ray). Ideally, it is diagnosed using a combination of fluoroscopy – a video x-ray that allows visualisation of the trachea as the dog inhales and exhales – and bronchoscopy, where a camera is passed down the trachea to assess the degree of collapse and assess for other conditions, such as pneumonia. How is tracheal collapse treated? The vast majority of dogs will respond to lifestyle changes (weight loss, being walked with a harness rather than a neck lead, avoidance of cigarette smoke or aerosols in the house) in combination with medications (corticosteroids, cough suppressants and antibiotics). Almost all dogs will have some improvement with the introduction of medication and up to 90% will be well controlled for 12-18 months. Tracheal stenting involves placing a metal (nitinol) mesh within the trachea under anaesthesia. The stent holds the trachea open and stops the airway obstruction. 90% of cases show a rapid improvement in clinical signs. It is important to know that dogs that have a tracheal stent placed will likely still require lifelong medications as outlined above. What are the potential complications with tracheal stenting? Tracheal stenting should only be performed by veterinary surgeons who have been properly trained in the technique. As the procedure requires fluoroscopy it is normally only performed at a referral practice. Many of the complications associated with stenting such as stent movement or fracture are more likely to occur if an incorrect size of stent has been placed. However, even when performed by appropriately trained personnel the complications seen with the technique can include inflammatory tissue growing through the stent and chronic infections. Up to 40% of cases that have a tracheal stent placed may require a second procedure at some point in their life. Following stent placement, most animals will be discharged within 24-28 hours. Pet of the month for January is Max, who often accompanies his owner on long runs over the Downs. 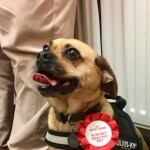 Last month unbeknown to his owner Max sustained an injury at the base of his tongue, which was not witnessed. Neither was there any evidence of blood or oral discomfort. Understandably Max went off his food and became listless. A swelling became palpable below his jaw and on examination, bruising was discovered under the tongue. The injury became septic and was flushed under anesthetic. Max is now doing very well and has finished all his antibiotics. Although we cannot be sure how Max sustained this injury, a number of dogs love to carry a stick and some will actively find their own stick when exercising off the lead on a walk. The majority of the time, this is harmless fun but sometimes part of a stick can go further into the mouth than planned! Stick injuries in dogs can be serious. Occasionally, a section of twig can get lodged across the hard palate (this is the roof of the mouth), between the upper molar teeth. If a dog has run at speed to pick up a stick then he/she may in effect ‘run onto the stick’, and there is potential for sections of stick or twig to penetrate deeper into the mouth, neck or throat. Although not applicable in Max’ situation, a good tactic to try and avoid your pets chasing and carrying sticks is to provide other toys for them to play with whilst on their walks, and definitely, as pet owners, we should avoid the temptation to actually throw a stick for our dogs! Pet of the month for December is Zebedee, who was brought in to us a few weeks ago as an emergency following a car accident. Zebedee’s jaw was fractured along the line of the mandibular symphysis. This is a fibrocartilaginous joint that is the most common site of mandibular fractures in feline patients and always needs to be repaired. 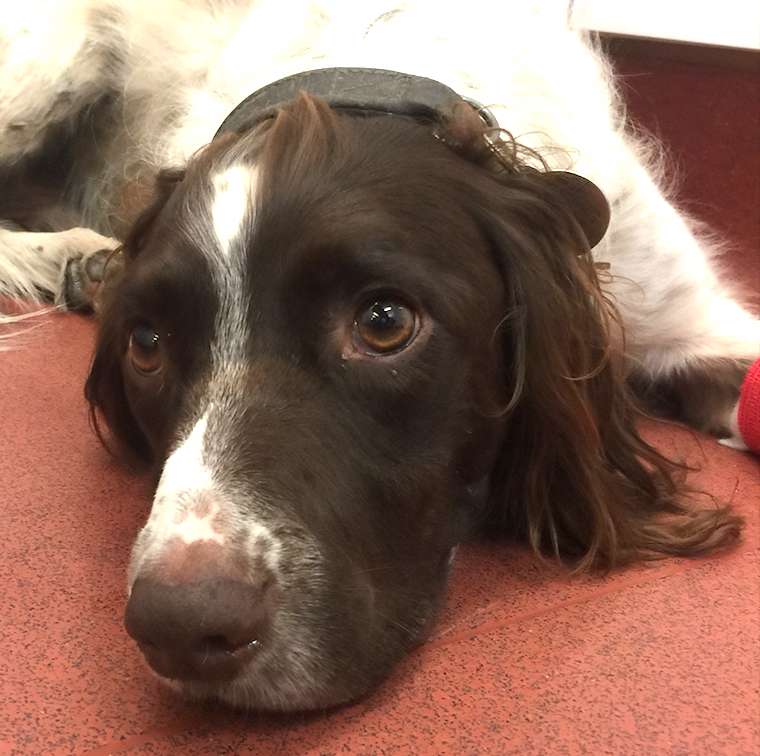 The repair was relatively uncomplicated but the swelling and trauma to his jaw meant that Zebedee would not be able to eat or drink normally for several weeks. To enable him to receive adequate nourishment an oesophageal feeding tube was placed and he was tube fed until he was able to eat and drink again normally. To further his woes Zebedee was not microchipped and an owner did not come forward, so we decided to take him on as a practice cat and are delighted that he has just this week been found a good home. 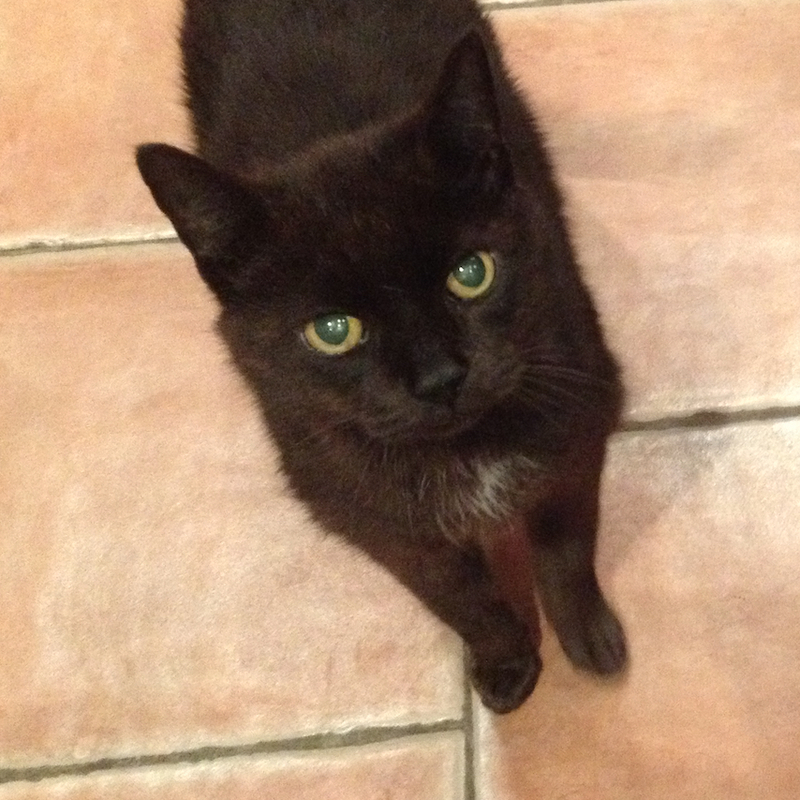 This month’s pet of the month is Fred who has sailed through his recent checkup and blood test for hyperthyroidism. 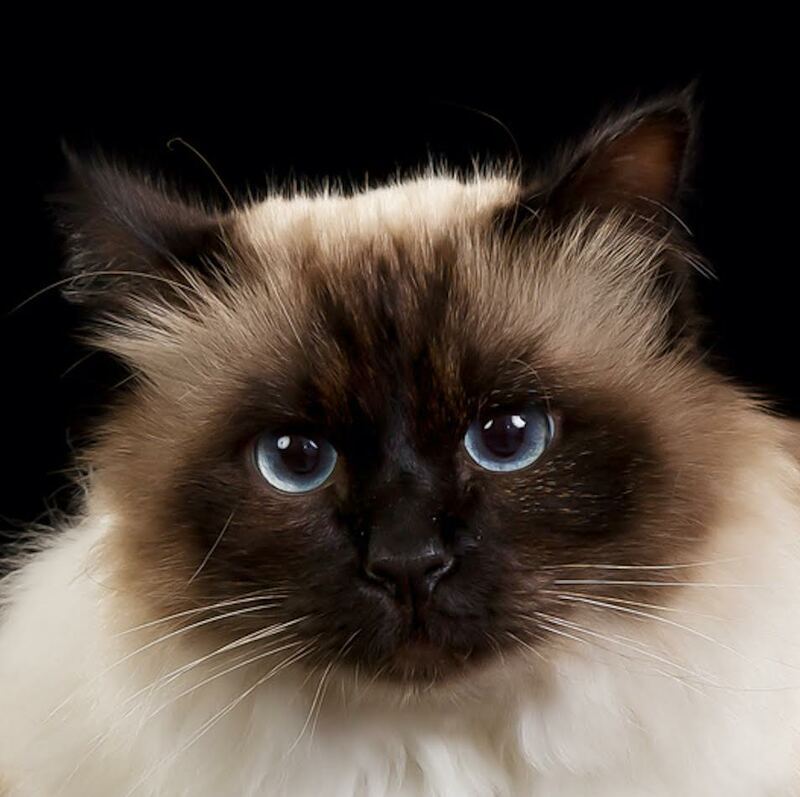 Hyperthyroidism is a relatively common disease of the aging cat. It is typically the result of a benign (non-cancerous) increase in the number of cells in one or both of the thyroid glands. The thyroid glands are located in the neck although there is occasionally additional tissue within the chest. In the image, the red shapes indicate approximately where the thyroid glands are located in a cat. The result of enlargement of the thyroid glands is an increased production of thyroid hormone within the body. Thyroid hormone controls the rate at which cells in the bodywork; if there is too much hormone, the cells work too fast. Despite many years of research, the exact cause of hyperthyroidism remains unknown. Cats fed almost entirely canned food have been reported to have an increased risk of developing hyperthyroidism but it is likely that there are many causes. What signs do cats with hyperthyroidism get? Hyperthyroidism is a disease of middle-aged to older cats with an average age of onset of 12-13 years. Increased drinking and increased urination, weight loss, increased activity, vomiting, diarrhoea and increased appetite are often reported. Physical examination often reveals a small lump in the neck which represents an enlarged thyroid gland. A diagnosis of hyperthyroidism is made by the demonstration of increased levels of thyroid hormone in the bloodstream. Thyroxine (T4) measurement is the initial diagnostic test of choice. How is hyperthyroidism in cats managed? Medical treatment with either carbimazole or methimazole. These tablet medications are given once or twice daily lifelong. Side effects are uncommon but can occur. They include vomiting and reduced appetite. Very occasionally severe bone marrow or liver problems can be seen. Surgical treatment. One or preferably both thyroid glands are removed with an operation. A short period of treatment with tablets is recommended prior to surgery. Anaesthesia can be a risk in older cats with hyperthyroidism that possibly has other concurrent diseases. There is a risk of a low blood calcium level after surgery if the parathyroid glands are removed with the thyroid glands. This can be a very serious problem if it is not recognised. Signs of a low blood calcium level can include facial rubbing, fits, tiredness, reduced appetite, and wobbliness. Low blood calcium levels are relatively easily managed with oral medication and treatment is rarely necessary lifelong. Radioactive iodine treatment. Radioactive iodine is concentrated in the thyroid gland and destroys excessive thyroid tissue. The drug is given by injection under the skin. After the injection, cats need to spend 2-4 weeks in an isolation facility whilst they eliminate the radioactive material. Owners are not able to visit their pets whilst they are in isolation. Hyperthyroidism can mask underlying kidney problems and these can become apparent after treatment. Blood tests are therefore necessary to assess kidney function as well as the thyroxine level during treatment. Sophie is recovering extremely well following the removal of a stick from her stomach using our new fibreoptic endoscope. Endoscopes can be inserted into the body through a natural opening, such as the mouth and down the throat, or through the bottom. An endoscope can also be inserted through a small cut (incision) made in the skin when keyhole surgery is being carried out. Our three endoscopes range from one that is small enough to examine the nasal cavity to larger diameter ones for exploring the airways and gastrointestinal tract. It is amazing to be able to explore deep within the body yet with minimal trauma to the patient, and in this instance without the need for a surgical laparotomy to remove the stick. For Sophie this meant instant resolution.